January 30, 2018 | FIRENZE, Italy - Gold Note - the Italian High-End manufacturer based in Firenze – is introducing IS-1000, an innovative all-in-one source designed to deliver high quality audio combining analogue and digital technology, available at a MSRP of 4200,00€ (5000,00$) worldwide through Gold Note retailers in October 2017. 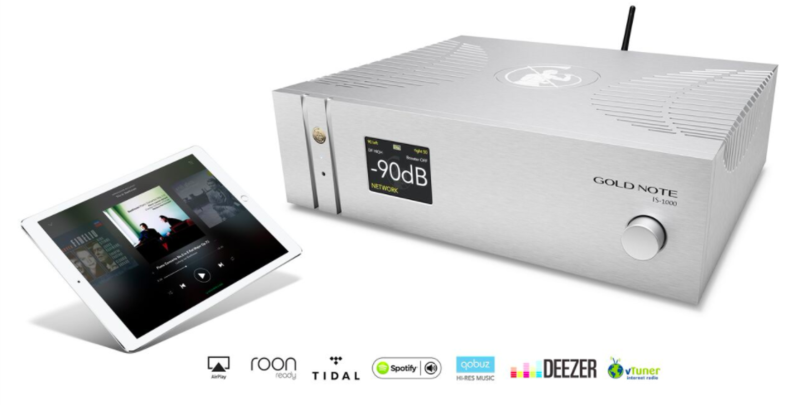 Gold Note IS-1000 is a Roon Ready device, fully compatible with multi-room systems and with a quick plug & play installation: simply connect IS-1000 to the network (Wi-Fi or Ethernet) and to the speakers, then explore the endless possibilities of music, streaming from Tidal & MQA via Tidal, Qobuz, Spotify & Spotify Connect and Deezer with Roon or the Gold Note dedicated App [available for iOS and Android] or browsing your collection of digital music stored on NAS, HDD and USB sticks - including DSD64 format. The new Class A/B amplifier with 125W @ 8Ω per channel (and 250W @ 4Ω) per channel developed exclusively for IS-1000 guarantees vivid dynamics, the pure sound and finest detail while also offering a wide range of digital and analogue inputs (including A/V and Phono MM/MC) to assure total control and the freedom to upgrade, expand or connect more devices to the IS-1000. With the knowledge and the experience developed in over 20 years of research across the whole spectrum of audio reproduction and recording, Gold Note is finally able to offer an all-in-one solution powered by technology and audio grade components to achieve audiophile sound. “Imagine a complete High-End stereo system enclosed in a beautiful aluminum chassis carved in bold Italian style: this is the best way to describe IS-1000.” explained Maurizio Aterini, founder of Gold Note. Featuring also 1 RCA variable and 1 RCA fixed outputs to use IS-1000 as a Streamer/DAC or as a Preamp or with active speakers.